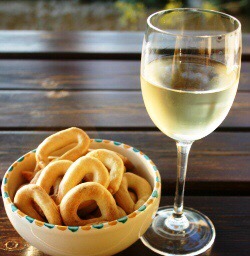 Traditionally in Puglia, you dunk your Taralli into your wine – most likely a fine Primitivo from the region. 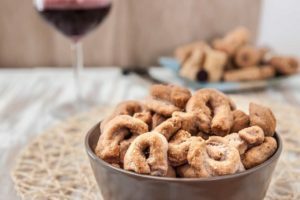 The recipe involves taking walnut-sized pieces of dough shaped into thin ropes about 5 inches (10 cm) long, then bringing the ends together to form a ring. It’s okay if they look like a teardrop. Next, the rings are briefly cooked in a pot of boiling water until they float to the surface, then removed with a slotted spoon and left to cool and dry on a clean cloth. 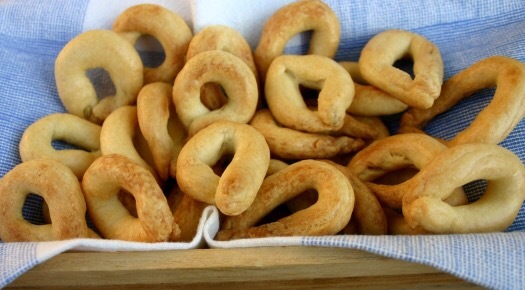 Place the taralli on a cookie sheet lined with parchment paper and bake until the taralli are golden brown. Cool on a rack and serve with an aperitivo – drink the rest of that white wine you used to make the dough – or fill a breadbasket and serve. In a large bowl, mix the flour and salt. Add the oil and wine, and mix with a fork until the dough forms into a rough mass. Dump the dough onto a wooden board and knead it for about 5 minutes, until it is smooth. If you want to add any optional spices, knead them into the dough (or divide the dough and add spice to ½ of the dough) – knead well to distribute the spice. Cover the dough and let it rest, along with your arms, for 15-30 minutes. Pinch walnut-sized pieces of dough, roll first between your hands, and then against the wooden cutting board, so that the dough forms a thin rope, about ½ inch (1 cm) in diameter and 4” long (10 cm). Shape each rope into a ring, and seal the edges together by pressing lightly, then set aside the taralli rings on a wooden board and cover with a towel. In the meantime, bring a large pot of water to boil. 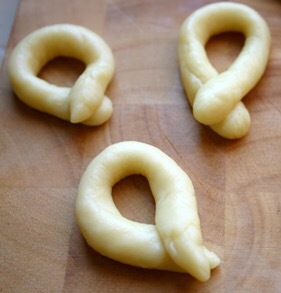 Put 6-10 of the taralli into the boiling water, and when they float to the surface – this will only take 30-60 seconds – remove them with a slotted spoon and place them on a cloth to dry and cool. Put the cooled taralli on baking sheets and bake in a preheated oven at 375°F (200°C) for about 25 minutes, until golden. 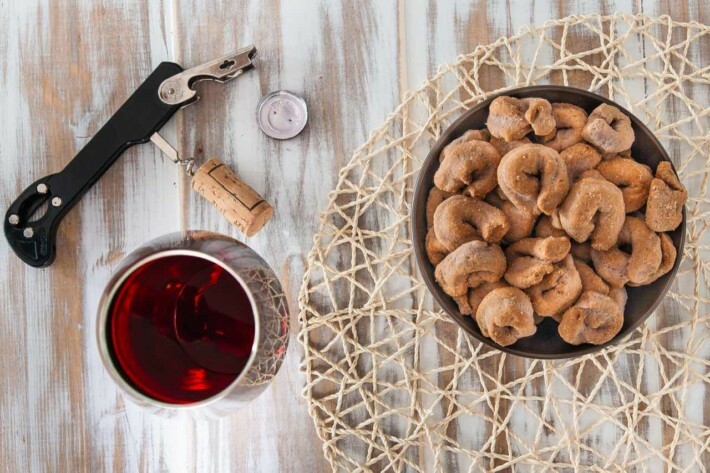 Store in a closed container to keep them crisp, and serve with an aperitivo – they are the a nice accompaniment for the rest of that dry white wine – or pile them into a breadbasket at dinner.